If you have a group of passengers in Stanwell Tops that need to travel to anywhere in Sydney, then contact Shire Shuttle Bus, the #1 Stanwell Tops Shuttle Bus service in Sydney. This Sutherland Shire Shuttle Bus can provide transport solutions for a multitude of passengers travelling to Sydney Airport, Sydney Harbour, Racecourses and any other point of interest in Sydney such as special events or festivals. See below for more information on each. Shire Shuttle Bus can provide Stanwell Tops Shuttle Bus services to the airport for any flights such as international or domestic. We can provide transport to all of the major airline companies such as QANTAS, JetStar, Virgin and many more. If you’re looking for a Stanwell Tops Shuttle Bus to the airport, we can provide a prompt and fast pick-up and drop-off solution for a multitude of passengers. Read More on Sutherland Shire Shuttle Bus to Airport. Shire Shuttle Bus can provide Stanwell Tops Shuttle Bus services to racecourse events such as Randwick Races, Rosehill Race Course and other major horse racing events in Sydney. We can provide transport to all of these large events, but also to smaller racing events held in Sydney at any major tracks. If you’re looking for a Stanwell Tops Shuttle Bus to the racecourse, we can provide a quick and friendly pick-up / drop-off outcome for a range of passengers. Read more on Sutherland Shire Shuttle Bus to Racecourse. Preparing for your big day? Shire Shuttle Bus can provide Stanwell Tops Wedding Shuttle Bus services to wedding events to anywhere in Sydney and its outer more regional areas. We can provide wedding transport to any wedding event in Sydney for a group of passengers. 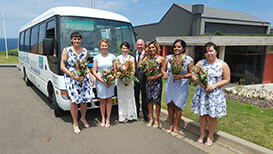 If you’re looking for a Stanwell Tops Wedding Shuttle Bus, then look no further than Shire Shuttle Bus services. Read more on Sutherland Shire Wedding Shuttle Bus. Shire Shuttle Bus can provide Stanwell Tops Shuttle Bus services for special events such as festivals, concerts and major sporting events. If you’re looking for a Stanwell Tops Shuttle Bus for special events, we can provide an effective and efficient pick-up and drop-off solution for multiple passengers. We have had vast experience dealing with major music events such as the Big Day Out, Good Vibrations, Future Music and plenty more. Shire Shuttle Bus can also provide transport to other specific concerts held for international artist at venues such as Acer Arena and ANZ stadium. Other major events such as international sporting events held at Homebush and other areas of Sydney that handle sports are also a regular destination for the Shire Shuttle Bus and our passengers. Read more on Sutherland Shire Shuttle Bus for Cruises.